As part of a renovation project at a Mid-west airport, the contractor had to change the direction of a stream that was located on the airport property as well as modify the shape of the stream to control the velocity of the water. To do this work, approximately 1,000 feet of the stream needed to be isolated and dewatered. Two dams were constructed to isolate the area and Godwin Pumps was called on to bypass the flow. The flow rate was 30,000 gpm (43.2 mgd). 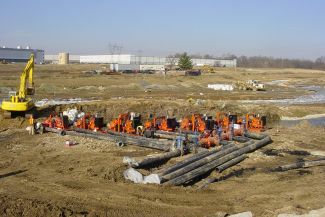 Godwin utilized nine 12-inch DPC300 Dri-Prime pumps, each set up with 12-inch HDPE suction and discharge pipelines combined into five 18-inch HDPE pipelines. The pipelines extended 1,000 feet each to the final discharge point downstream. 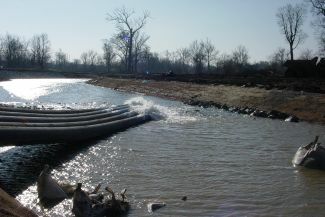 In order to minimize erosion at the discharge point, end caps were used on the 18-inch lines and openings were cut into the top of each line as well. Two Godwin fusion technicians working with labor provided by the contractor completed the entire set up in 5 days. The bypass saved the contractor significant time and cost on the project.